Terminated workers from different business giants built a week-long protest camp at the foot of Malacañang in Mendiola Bridge. The ‘Kampuhan Kontra Kontraktwalisasyon’ (KKK) is composed of employees from Jollibee Foods Corporation, Philippine Long Distance Telephone Company (PLDT), UniPak sardines manufacturer SLORD Development Corporation, Manila Harbour Centre, Pearl Island Commercial Corporation, and workers from Valenzuela. Coming from their respective protest camps at the gates of the said factories and workplaces, the workers built a protest camp to bring their fight against contractualization closer to the Presidential Palace. “We hope that President Duterte can now hear our calls for regularization and against contractualization loud and clear. As he listens, we hope to hear him address our issues and concerns in his SONA on Moday,” said Kilusang Mayo Uno chairperson Ed Cubelo. Samahan ng Manggagawa sa Jollibee Foods Corporation (SM-JFC) President Rogelio Magistrado deplored Pres. Duterte for his ‘failed promise’ to end contractualization. “Sabi ng pangulo, ‘When I assume the presidency, I will put an end to endo’. Ang nangyari pala ay ‘no end to contractualization’,” Magistrado said. In the two years since taking oath, Duterte through the Department of Labor and Employment have so far issued several department orders, the latest of which is Executive Order 51. The said order prohibits illegal contracting and subcontracting. Kilusang Mayo Uno and other labor groups have called the order ‘useless’ as there are already provisions against such labor arrangements in the Labor Code and several other department orders. According to the labor group, government’s moves to end contractualization are also being circumvented by companies such as JFC and PLDT. 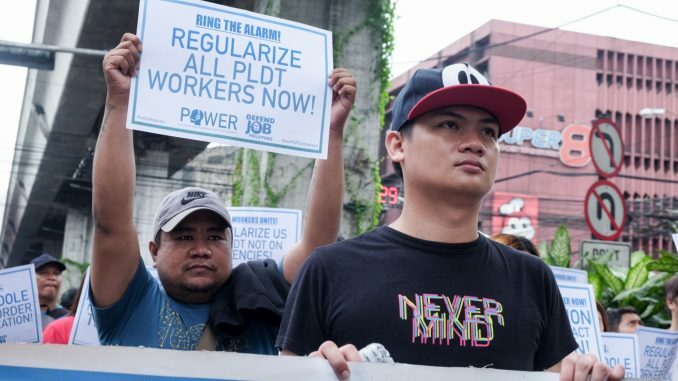 The fast-food company terminated 400 workers from its main commissary in Parañaque, while the telecommunication group displaced its more than 12,000 workers by terminating their agencies’ service contracts. Jollibee Foods Corporation and PLDT place first and third in the list of companies practicing labor-only contracting. Both have so far refused to comply to DOLE’s order to regularize their employees. Workers manning the KKK will be joining other sectors and progressive organizations during the protest on Monday, July 23. What they dub as the ‘United People’s SONA’ along Commonwealth Avenue will coincide with Pres. Duterte’s address at the House of Representatives. The KKK, which will run until the morning of July 23, is open for all and will feature several activities such as educational discussions, solidarity and cultural programs, film screenings, and press conferences. The post Workers mount Mendiola protest camp days before Duterte’s 3rd SONA appeared first on Manila Today.